So, how does one set up for the Hippies and Hipsters theme? Well, one major point would be to make sure you have nothing mainstream lying about. Toss out your Nickleback playlist, remove those Star Wars posters – just get rid of anything that, at first glance, is highly recognizable. Instead, it’s a clever idea to decorate the event space with peace signs, peace flags, and maybe a poster or two for some independent band that you’ve probably never heard of. If you’re a Hipster or Hippie throwing this party, than you’re a good step ahead of the game! When it comes to what kind of alcohol to have available, don’t forget that you’re catering to two differing crowds. For Hipsters, you want to carry a healthy supply of Pabst Blue Ribbon. Don’t try to figure out why, but that seems to be a pretty popular drink amongst them. Hippies, on the other hand, probably won’t be as picky, though they may be looking for something a little more “antique” or aged. Realistically, Hippies leaned more towards “greener” pastures, if you catch my drift. Music is always a big part of any party, so make sure you have a decent supply on hand. You will need to create a playlist that caters to both the Hippies and Hipsters, which is going to take a little research. Some of the more “Hipster” focused artists include Grizzly Bear, Stray Kites, Neutral Milk Hotel, and Neon Indian. Surely, the list is extensive and mostly consists of independent bands that you’ve never heard of before. For Hippies, you will want to find music that generally portrays a message. Dig up some of The Beatle’s hits, like “Revolution” and “Lean on Me” and you’ll be on the right track. Hippies have several modes of dress, but the most recognizable includes bellbottoms, headbands, and a “grungy” look. 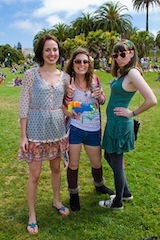 Modern Hippies aren’t as unclean looking, but typically follow the same dress patterns. Free-flowing dresses are a pretty big staple – obviously nothing like a cocktail dress. Try to stick to outfits that are either earth toned or full of funky colors. If you want to go for authentic Hippie, either let your hair grow out or look into a wig.